Chief Minister Ramesh Pokhriyal Nishank said today that the calamity that struck the state was unprecedented in the past 100 years, but claimed that his government handled it successfully despite restraints of resources. 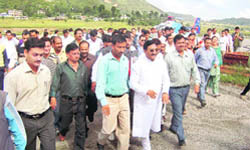 Attacking the Dr Ramesh Pokhriyal Nishank-led Bharatiya Janata Party (BJP) government in the state for mishandling relief operations in the region, former minister and senior Congress leader Indira Hridayesh has demanded that Nishank should account for the Rs 500 crore Central aid given to his government. Senior Congress leader Suryakant Dhasmana visited flood-hit Kehri and Premnagar Wing number-7 and assured affected persons of prompt relief today. With unprecedented flood hitting the district, MP Harish Rawat and MLA Madan Kaushik visited several parts of the flood-hit areas inspecting the relief works as well as listening to the woes of the people. The airlifting of the Kailash Mansarovar pilgrims from Gunji to Dharchula has been postponed for yet another day today as the Air Force helicopters failed to take off from Dharchula to Gunji. 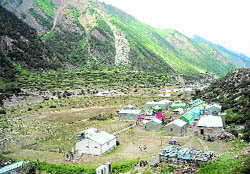 A file photograph of the Gunji camp on the Kailash Mansarovar Yatra route in Pitthoragarh. The 20-member Brazilian trekking team that had been struck in Badkot region of Uttarakashi district for past many days due to incessant rains were rescued today. The state government is progressing steadily toward formally launching the Motorcycle Rent Scheme to enable the private operators rent out motorcycles to tourists for travel purposes. But it certainly needs to change the typical non-cooperative attitude associated with the bureaucrat community which may disappoint many aspirants to abandon the thought of joining this trade. The first casualty is the man, Satya Prakash Solanki, allegedly responsible for swinging the state in starting up this project. But till date, he is struggling to get complete information and reasons for the rejection of his application by the Transport Department. In an unprecedented development, an FIR has been registered against a temple committee for organising animal sacrifices in Uttarakhand. The beneficiaries of Veer Chandra Singh Garhwali Self-Employment Scheme in the tourism sector have been asked to utilise the funds loaned to them only on projects for which they apply. At a meeting held here to choose the beneficiaries, District Magistrate Shailesh Bagauli said the beneficiaries should also ensure that they repay the loan instalments on time. The increase in the discharge from the Tehri reservoir after its level reached the 831.45 metre mark has not spared the 400 MW construction Koteshwar dam site in the state. Most of the dam site, including its power house, has been inundated. 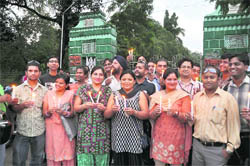 To mark the World Deaf and Dumb Day today, members undertook a candle march that finally culminated at the Gandhi Park. They were also supported by the orthopaedic disabled. One-week Hindi Diwas programme of the Forest Research Institute (FRI), Dehradun, concluded here today. At a function held today, FRI Director Dr SS Negi presented the prizes to the winners. He called for usage of more and more of Rajbhasa in the official works. 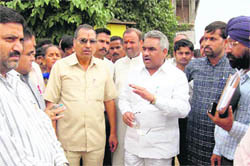 Sports and Disaster Management Minister Khajan Das visited rain-affected areas at Nainbagh in Jaunpur Block today. “We could lift nearly 25,000 stranded and marooned people successfully to safer places with the help of local volunteers,” said Nishank, who reached here after visiting calamity-hit villages of Qurie-Jimia in Munsiyari tehsil. The Chief Minister said the government wanted to rehabilitate the people of the villages where the nature calamity hit every year, but the state government had no land to rehabilitate them. “We have asked the Prime Minister that the forest land in the state should be released for these people so that the state government could start the rehabilitation process in the disaster-hit areas,” said Nishank. He said nearly 5,000 persons from 980 families of 66 villages in the district were in a state of rehabilitation. He added that more than 100 villages of the state were already scheduled to be rehabilitated. Answering a question on the allegation by the Congress that the state government had overnight demanded a package from Rs 5,000 to Rs 21,000 crore without submitting any estimation to the Centre, he said, “This is not the time to do politics on relief fund but to co-operate to help the needy people,” said Nishank. Talking to The Tribune, Hridayesh said, “The Central government has promised to give all possible help to the state, but the Chief Minister must give an account of the money spent by his government. She was very critical of the manner in which the government has been handling relief operations in the region. She accused the ministers of total insensitivity in addressing the concerns of the people. “The Disaster Management Minister was here recently and had announced a grant of Rs 2 crore for works to be undertaken for taming the Rakasiya nullah in Haldwani which has been the cause of major devastation in the town that is known as the nerve centre of Kumaon. She charged that the entire ministerial force is incapable of getting work from the bureaucracy as it does not have the will to get involved in their jobs and maintained an indifferent attitude towards the problems of the people. “The entire Cabinet is helpless in the face of the events except for the Chief Minister who is busy putting the ball in the Centre’s court on every trivial matter and seeking massive financial packages,” she charged. She charged that things are not moving at the pace they should and people were continuing to suffer on account of official apathy. Hridayesh had also addressed mediapersons on the issue at Haldwani today. She said that it was time that the state government rises above petty politics and gets down sincerely to provide relief to the suffering people. She also called upon her party men to come forward and do everything possible to help the people in the times of distress. Dhasmana later apprised the District Magistrate of Dehradun Sachin Kurve that three houses in Kehri village were completely damaged and two were partially affected. None of its occupants received any help from the administration. In Wing-7, he informed that almost 600 houses got inundated to a height of 8 ft due to the flooding of the lake at IMA premises. “The lake does not have any outlet which is the reason for the water flooding the houses and roads in the area,” he said. He demanded that the DM should arrange for outlets in the lake. The others who accompanied him were city chief organiser of Congress Sevadal Krishna Khatri, Tajinder Kaur, Diwan Singh Bisht, Shahzad and Nand Kishore. Rawat, who has been visiting the flood-affected areas for the past few days, also donated his one-month salary to the district administration for flood relief works. Urging people to donate as much as they can to the relief fund, Rawat said this was the testing time for the state as in hills the natural disasters had created havoc while in plain areas flood fury had severely affected the normal life. Rawat also demanded a special compensation package to the farmers with the state government should exempt the interests on the loans given to them. Fearing that the Rs 500 crore grant from the Central government to Uttarakhand for flood relief might be misused by the BJP-led state government, Rawat said keeping in mind the Maha Kumbh experience, in which Rs 700 crore were misused by the state government, a special monitoring needed to be done in this regard. Kaushik also visited various areas of the city and directed administration and municipality officials to speed up the compensation as well as cleaning work of the areas. The 37 pilgrims waiting for airlifting for the past four days, now will finally be lifted from there by the Air Force helicopters on Saturday depending on the weather condition. The Air Force helicopters landed at the Dharchula Army base and tried today to reach Gunji but due to heavy rain between Chiyalekh and Gunji they could not reach Gunji. “The MI 17 helicopters of the Air Force today reached at Dharchula after the rain stopped there and are waiting for the weather clearance,” said KPS Nimbadia, Commandant of 7th BN of the ITBP. “All pilgrims at the Gunji camp are hale and hearty and the ITBP doctors and other personnel are looking after them, but they are not in a position to communicate with their families as a DSPT telephone set meant to communicate with the families of pilgrims from the Gunji camp has been removed by the BSNL some 15 days ago,” said ITBP source. Commissioner Garhwal Ajay Nabiyal said that all 28 members of the team were airlifted and brought to Dehradun. He said the administration had acted promptly to the SOS call from the Brazilians. The Brazilians were provided medical assistance at Dehradun. A recent thick set of 60 pages of information sent by the State Transport Authority (STA) to him to answer his RTI application merely presents a cumbersome picture but not clear-cut information. Secretary, Transport, S Ramawamy had assured of doing justice to the man and suggested him to meet him instead to fulfil all obligations to get a licence. The assurance seemed a far cry in a sense that most of the time the officers of the Transport Department at various level in Secretariat are usually told to be absent in chair for various reasons such as sudden transfer, illness, meetings or being out of station. This is where Solanki became victim of the red-tape culture. He said, “I was the first one to apply after getting excited over starting up this business on the lines of people in Goa and Kerala. I approached the STA in December 2009 when they told me that there was no such provision in the state, whereas the fact was that such an act existed since 1997, but the department had no clue of it. Later, they kept dodging me saying that the department was in process of enacting an act in this direction. They kept rejecting my application for one reason or the other without telling me the actual reason. Different officers gave different reasons. On July 30 I got to know that they passed the application for the licence of one Ranjit Singh Chabra while rejected mine for being incomplete. From lower ranks to the higher ups, all had some other hidden motive, which I never fulfilled because I was hard-pressed for money”. Exasperated, Solanki, who met all top officials, including Regional Transport Officer and Additional Transport Commissioner, had to take recourse to the RTI, first on July 9 and then on August 17 but each time, he said, the department smartly played with words. He said, “I wanted to start this business by taking loan under the Veer Chand Self-Employment Garhwali Yojna for which I was to submit licence, but the STA declined to give me licence asking me to first set up office, purchase five motorcycles, telephone, etc. but for that I needed money on loan. In a way, I was moving in circles without any success”. This time around few days ago, he got 60-page information from the STA as an answer to his RTI application. Solanki had got some hope that by next summer when tourist season would begin, he would be able to meet all obligations of the STA by working on them one by one as and when these come. Every year, the famous Naina Devi temple in Nainital attracts thousands of visitors from across the state and beyond, especially on special occasions like the Nanda Ashtami festival. Animals are sacrificed throughout the year at this lakeside shrine. In order to prevent such slaughter, the People for Animals (PFA) had approached the Nainital High Court Chief Justice to apprise him about the ongoing PFA campaign against illegal animal slaughter in the state. The State Animal Welfare Board installed signboards at the temple site informing the public that animal slaughter in public places is a punishable offence unless conducted in a registered slaughter house within municipal limits. However, these signs proved ineffective in preventing visitors from undertaking the ritualistic slaughter of hundreds of goats, sheep and lambs at the shrine. The FIR was finally lodged at the Mallital police kotwali by the PFA. The Uttarakhand chapter of the People For Animals (PFA) had earlier held a meeting with the Nainital district administration, the Nanda Devi temple committee and the Ram Sevak Sabha Samiti on September 14 to discuss the continued illegal animal slaughter in the name of religion in the famous Naina Devi temple on the occasion of Nanda Ashtami. However, hundreds of goats were slaughtered because the district administration refrained from taking any concrete action to prevent this bloodshed. According to PFA office-bearer Gauri Maulekhi, in the Slaughter House Rules 2001, made under the Prevention of Cruelty to Animals Act 1960, the killing of any animal which may be pregnant, sick, mother of an offspring less than three months old or the young one of an animal is a punishable offence. “The few persons who sacrifice animals at the temple are a nuisance and a source of annoyance to the tourists and devotees who may want to visit the shrine and exercise their public right. The sanctity and peace of the religious and spiritual public centre is being held ransom by such people,” Maulekhi argued. The District Committee, which has been given the task to choose the beneficiaries, had received 91 applications against a target of 66 for the meeting. Out of these 56 applications were for the grant of loans for purchasing vehicles. Of the remaining 22 applications were for setting up of motels, five for opening restaurants and public call offices (PCOs) along with two each for starting centres of yoga, adventure sports and tent accommodation. One application was for opening a workshop. Chairman of the Tehri Hydro Development Corporation (THDC) RST Sai belied the news circulating around of the damage to the construction site to the tune of Rs 70 crore. He said: “It is not possible to estimate about the magnitude of the damage at this stage. It can only be ascertained after the water flows out of the site. Even for the calculation, the experts of various equipment would be called to test the exactness of the machinery.” He though conceded that the work at the site had suffered a great deal. The irony was that the THDC upped the water level to 830 meter to speed up the pace of construction at the Koteshwar dam, resulting into flooding of 412 families in 25 villages. More than 120 members from different parts of the state took part in the rally. “We want to build awareness about the need to learn sign language and to generate sensitivity about our needs,” said Prem Kumar. Members from the Deaf and Dumb Association, Uttarakhand, and the Paralympic Association participated in the rally. After gathering at the Gandhi Park, the members distributed handbills conveying the importance of the sign language. Competitions linked to the Hindi typing, essay writing and poem were the highlights of the Hindi week proceedings. Arvind Johri, Bhawani Dutt Badola, Mahendra Sharma, Anand Singh Rawat were among the employees honoured on the occasion. Khajan Das reached the spot by a helicopter as the Mussoorie-Yamnotri national highway was blocked at several places due to road cave-in. He also went to Pantwari and Bhandarsi villages to asses the damage. He interacted with the families that have lost their livelihood due to the cloudburst and flashfloods. The destruction was visible everywhere in the villages around Nainbagh. Speaking to the media, the minister said the devastation due to the rains had broken all records this year. He also said that the state government’s priority was to provide immediate elief to the tourists and villagers. Air Force helicopters will take rations to the tourists stuck at Barkot and Nainbagh. Meanwhile, the Dehradun-Mussoorie-Yamnotri highway has been opened. Khajan Das said it would take more than three years to repair the damaged infrastructure in the state.